You probably have heard about the dangers of gum disease, at least in passing, but may need to know more about the subject. Understanding the causes, dangers, and key dental care prevention techniques is critical if you are to keep your teeth and gums as healthy as possible. Keep reading to learn some key facts about the gum disease referred to as gingivitis and be sure to schedule routine visits with an affordable dentist in Philadelphia. One type of gum disease, known as gingivitis, is an inflammation of the tissue that supports and surrounds teeth. 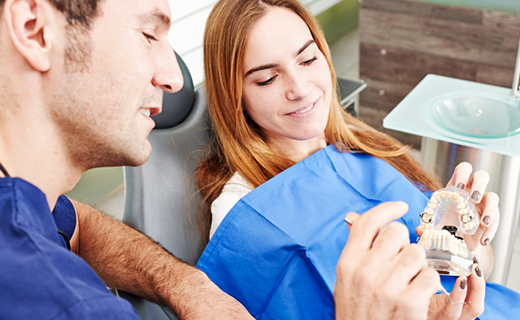 Typically the result of inferior dental care, gum disease is actually quite common. Known for producing swollen, red gums that bleed during flossing and brushing, gingivitis is the first step toward the more serious condition known as periodontal disease. Though gingivitis mainly impacts the gums that surround your teeth, periodontal disease is marked by inflammation and infection of the bone that lies beneath those gums. Gum disease begins when food particles and saliva combine to produce bacteria, which in turn form plaque buildup. When not properly removed in a timely manner, plaque mineralizes to form tartar that must be removed at a local family dentistry practice. When plaque is allowed to remain on the teeth and gums, irritation ensues and gingivitis develops. If this gum disease goes untreated, it can spread to the bone and become periodontal disease, which is far more serious. At this point, the bone and gums will recede from the teeth, causing pockets to develop that are havens for additional bacteria and plaque. Ultimately, bone tissue will continue to degrade and your teeth may loosen and fall out. In most instances, gum disease is the result of poor dental care, but there are additional risk factors that include things such as smoking cigarettes, poor diet, and stress. Puberty and pregnancy have also been linked to increased incidence of gingivitis, as has diabetes. Anti-seizure drugs and other medications can also produce increased risk of gum disease. Fortunately, reversal of gingivitis is possible, provided you take steps to correct the poor habits that caused the condition to develop. Removal of plaque by a dental hygienist at your family dentistry office is key, but following that up with a solid dental care routine, and possibly antibiotic therapy, is essential if you want to stop gingivitis in its tracks and prevent it from turning into periodontal disease. To get the dental care you deserve from an affordable dentist in Philadelphia, call Gentle Dental of Pennsylvania today at (215) 789-9675 or make an appointment. The staff & doctors are friendly, helpful & professional. The overall experience was positive. Friendly and professional people there…Fast service…. I appreciate the timely manner to get appointments ad the concern everyone has for the patient. My appt started on-time, and the hygienist and dentist were kind and efficient. Feel that Dr. Ferguson and Dr. Minetola are very courteous and very competent. The staff is always friendly and helpful.